My friend, Molly Mundt, created the coolest Doggy Duvet in the industry called the Molly Mutt. 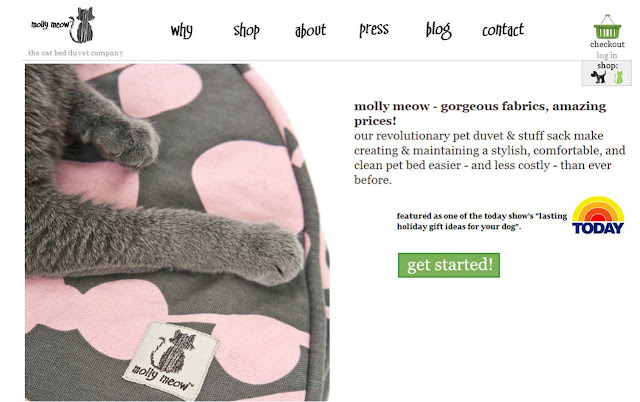 But she didn't stop there, she has just come out with a Kitty Duvet called the Molly Meow. Molly is one of the best designers I know and she really came through on the Meows. I'm so proud of her for all she is accomplishing. Btw - she already has the endorsement of Furio Bain, the coolest cat with a blog around. Here's Furio during his Molly Meow photo shoot. Behind the scenes at Furio's MollyMeow photoshoot from Alex Bain on Vimeo.